The dendrobium orchid was used by Makani as a fixative in his work, and this he sourced from high up in a tree. To begin, with his fingers he rubbed the red ochre all over the bark, creating the red ground on which to paint, employing at least three varieties of brushes for any detailed work and ‘roughly outlining each figure with the orchid stem, having chewed its end to make it juicy’. 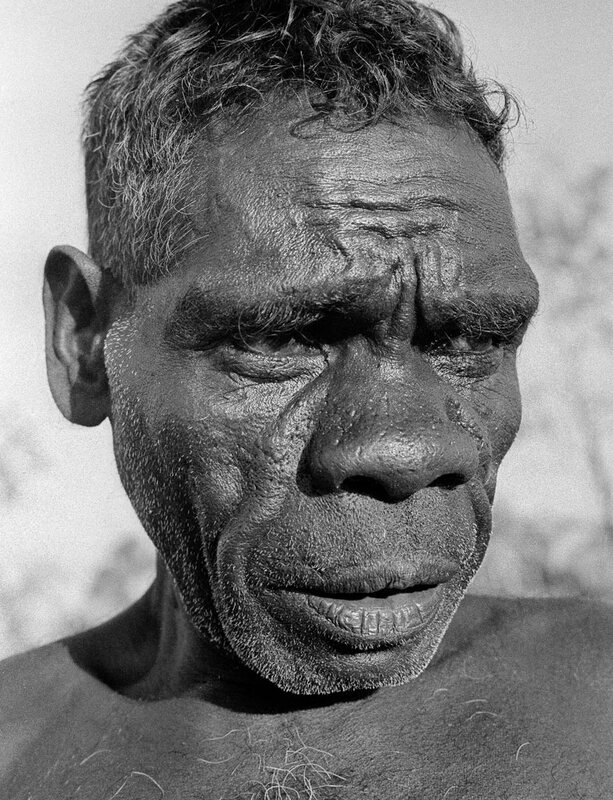 Makani had moved to Maningrida in western Arnhem Land not long after a permanent settlement was established there in 1957. Prior to this he was a resident in the small island community of Milingimbi, where he had his own garden and grew bananas, which he sold in the mission store. He had also apparently spent some time at Fannie Bay in Darwin. 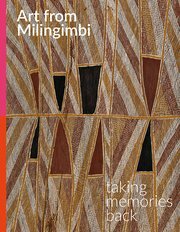 An extremely prolific artist, Makani’s earliest known works were collected by anthropologist Donald Thomson during his first trip to Arnhem Land between 1935 and 1937. Over his career Makani painted diverse subject matter in a range of styles. He excelled in a form of abstract purity, as seen in Small clouds c1950. On an entirely visual level it is an intriguing work, such is the balance between form, colour and delicate miny’tji (clan designs). Clouds also become a dominant feature in Malwanatharra (Sandy Beach) c1950, where they form a border of red and black triangles running along the top and down the sides of the work. Enclosed within this are forms of centipedes, which connect the bark to the location of Sandy Beach on the mainland. A similar design for clouds is evident in March fly c1950s, where it forms three distinct panels within the work. These are horizon clouds located to the north, with the work again referencing Makani’s clan estates on the mainland. Most interesting here is the portrayal of a march fly in the lower section, beautifully painted with fine details and a heightened realism. Its delicate wings are fully extended, its string vividly apparent and somewhat menacing. Makani was also a master of creating complex compositions where elements jostle for space, as in Dhuwa and Yirritja animals 1960. Here numerous figurative elements appear embedded within country, their forms somewhat hidden within the vast miny’tji of country. The undulating form of a serpent gently dissects the composition, with further divisions created to both sides by discrete line work. Within these sections figurative elements are literally attached to the land, their forms barely distinct from the patch of miny’tji to which they are connected. The use of multi-directional cross-hatching to create this patchwork results in a field of shimmering brilliance, reminiscent of the mosaic of figures enmeshed within country, as observed by Attenborough.